Celebrate Super Bowl season with a fun football coloring page! Your child will love coloring in the football player with his favorite team's colors. Did you know coloring will help strengthen your child's hands, giving him better writing and typing skills? Gear up for Super Bowl 50 with this fun American football coloring page! colour in football players from all parts of a team. 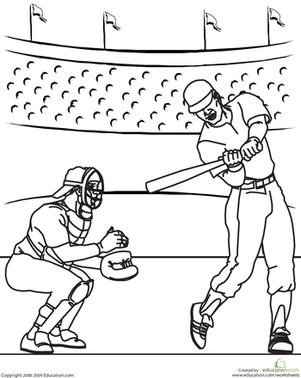 This baseball player coloring page features a baseball catcher and a batter who is taking a mighty swing! Take a coloring timeout with your child and enjoy this football coloring page, full of fun facts to read as you colour. This rugby coloring page shows your child a fun and unusual sport. colour this rugby coloring page with your child. This tennis coloring page features a player who is about to hit the ball backhand with his racket. colour this worksheet with your little tennis player. 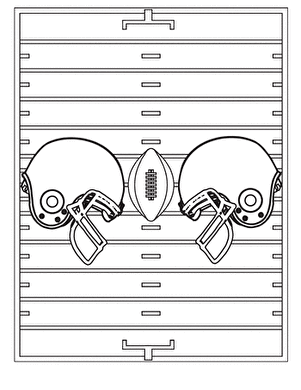 This fun coloring page features clashing helmets on the football field background. This hockey coloring page shows your child the fast-paced sport of ice hockey. Use this hockey coloring page with your little sports fanatic. This sporty coloring page shows a volleyball player on the beach. Help the player hit the ball over the net with this volleyball coloring page. In this activity, your child will use household objects to sculpt his very own football. Take a swing at this fun coloring page, where you can colour your favorite team's logo on this player.